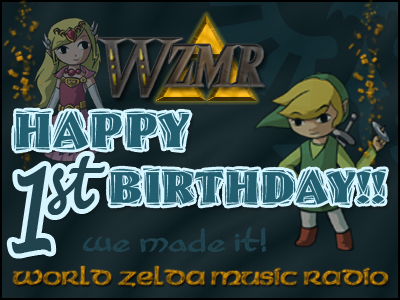 The World Zelda Music Radio has turned a year old now, and not a day goes by that we do not appreciate what they are providing to the community. A live streaming radio that plays Zelda music all day… what more could you possibly want? We sit back and to take a second to reflect on what WZMR has done for the community. WZMR was created on June 21st, 2008, as a simple idea. Stemming off of the other wildly known music project in the community, ZREO, WZMR wanted to bring the community together to share our love of the Zelda music. They originally intended websites to partake in creating their own regular shows. We here at ZeldaInformer thought this idea to be so great that we instantly partook in the festivities with the semi-retired Zelda Remix Hour. I say semi-retired, because there has been a little bit of discussion about bringing the show back. I am sure Ebuch may be jumping for joy right now reading this, but really it’s his ideas and visions that allowed a show like ZRH to even come into existence. Ebuch is the man responsible for WZMR’s existence, and to that end has been forever friendly with everyone involved in the community. He has provided some sound advice behind closed doors to help other sites grow, just as some of us have helped his site grow as well. WZMR is presently the only Zelda Radio is readily available to anyone with a internet connection. With multiple ways to listen to the radio available, they ensure anyone who wants to listen can do so easily. In fact, while writing this, I am listening to radio and still in shock that such a thing is so readily available. It’s almost become tradition to turn on the tunes to help me fall asleep soundly. Zelda music truly is some of the best in all of gaming. So on this day we salute you WZMR. We look forward to many more years of amazing Zelda goodness to come. What are you waiting for folks? WZMR is waiting for you to begin tuning in.